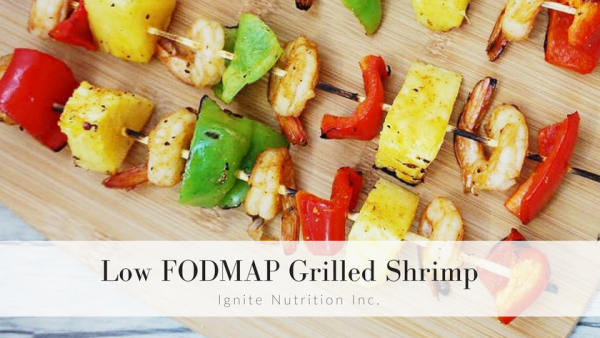 Low FODMAP Grilled Shrimp | Ignite Nutrition Inc. It is finally that time of the year when we get to dust off the old BBQ and put out the patio chairs! Summer has arrived and it is time to soak up all the sun we can get! Starting the low FODMAP diet in the summer can be frustrating with all the things we typically grill, which is why we created this super simple, crowd-pleasing low FODMAP grilled shrimp recipe! This recipe works great as an appetizer for those Sunday potlucks with friends, or a light dinner when served on top of your favourite grain. It is simple and delicious. What more could you ask for? Give it a try! Place shrimp in a sealable plastic bag and pour garlic-infused and plain olive oil over top of shrimp. Shake bag lightly until shrimp is evenly covered. In a small bowl mix brown sugar, paprika, Italian herb seasoning, salt, and pepper. Set aside 1 TBSP of the spices that will be used later on the veggies. Sprinkle the rest of the spices onto the shrimp in the sealable bag, seal bag, and mix well until spices are evenly coated. Allow the shrimp to marinate by storing shrimp in the sealed bag in the fridge for 1-4 hours. While the shrimp is marinating, prepare the peppers and pineapple by chopping both into large pieces that will be assembled on the skewers later. In a bowl, sprinkle the remaining seasoning over the vegetables. 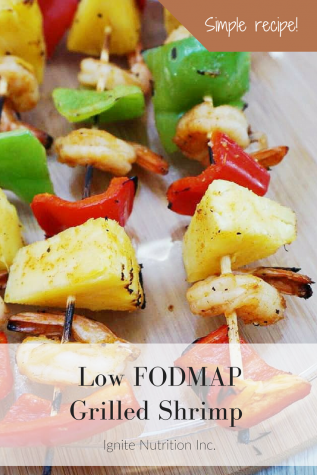 Once the shrimp has marinated, thread the shrimp onto the skewers followed by a pineapple, red and green bell pepper. 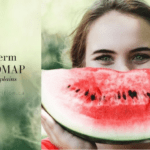 Repeat the pattern until the skewer is full. Repeat steps with the additional skewers until all food is threaded. Place the skewers on the pre-heated grill and cook for 2 minutes, rotating between each minute. Remove, and serve with fresh lemon and on top of your favourite grain. 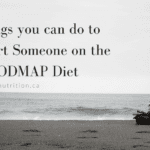 I consent to Ignite Nutrition Inc. collecting my details through this form.